Toronto city councillor Jim Karygiannis issued a press release that included photos of the graffiti. Toronto Mayor John Tory said it's "disturbing" that someone would choose to spray-paint anti-Muslim graffiti on a Muslim school in Toronto's east end during the holy month of Ramadan. 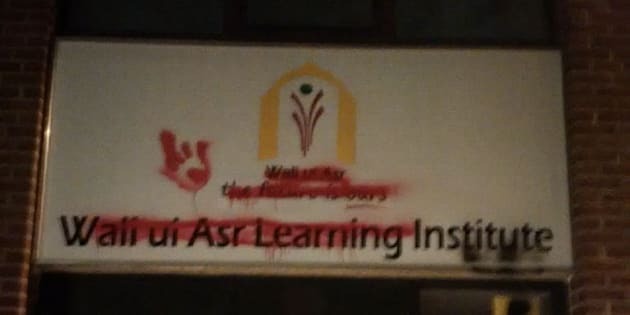 City councillor Glenn De Baeremaeker first spotted the graffiti on the Wali ul Asr School while out for a bike ride in the neighbourhood Monday night, according to reports. De Baeremaeker told CP24 his first thought was about the school community seeing the messages when they arrived in the morning. "It's disgusting, it's not who we are, and I can't imagine a five-year-old or 10-year-old innocent child coming to school and parents having to walk past this type of hurtful, racist graffiti," he said. De Baeremaeker told the Toronto Star he called local councillor Jim Karygiannis immediately, and the two arranged for staff to clean off the graffiti before students arrived in the morning. Mayor Tory tweeted "this hatred is unacceptable at any time." I know @TorontoPolice will use every effort to track down whoever did this. Thanks to Deputy Mayor De Baeremaeker & Councillor @jimkarygiannis for working with City staff to remove this awful graffiti as quickly as possible. This is not the first time hateful messages have appeared on the school, according to CTV Toronto. Karygiannis told CP24 he and De Baeremaeker are going to push for funding for a security camera. "We live in a city where diversity is our strength, that's our motto," he said. "For somebody to do this, it gets me very upset."